This saddle was made for the saddle show at the 25th Anniversary of the Elko Poetry Gathering in Elko Nevada. Was one of twenty-one on display for several months. 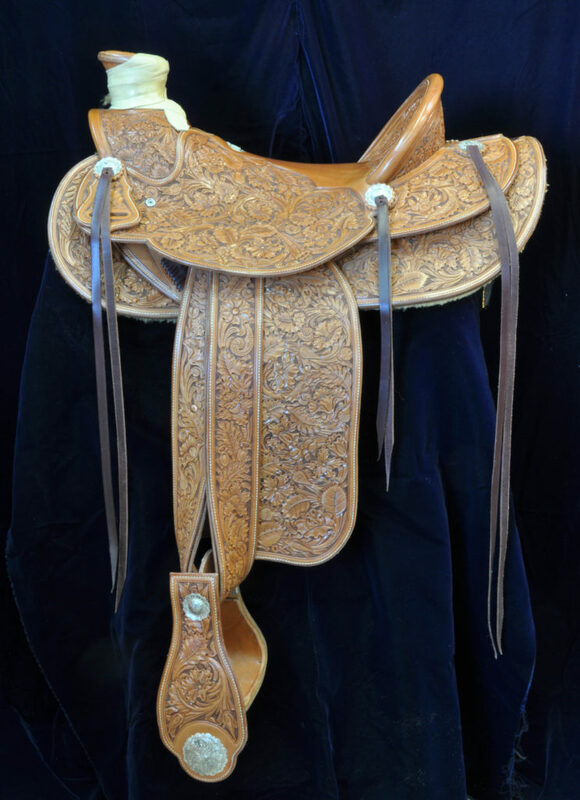 This saddle was made on one of the two most famous styles of buckaroo trees, the 3B. 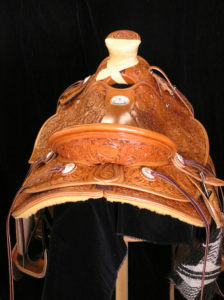 The saddle was patterned after the most popular styles of saddles during the peak of the buckaroo heyday. The tree is a 3B 9 inch fork, shovel cantle 4 inches high, a wood post horn 3 1/2 inches high with a 4 inch cap. 5/8 single ring rigging, with hand forged stainless steel rings over laid with sterling silver and hand engraved rigging leathers are closed with Spanish lace in true California fashion. California round skirts, California half double stirrup leathers and fenders that lace at top of fenders. 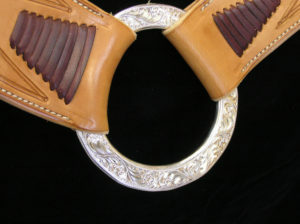 The old Visalia Grandee style of stirrups with sterling silver bolt heads and large concho at the bottoms on bell bottom style 4 inch wide stirrups. All leathers are doubled and stitched. 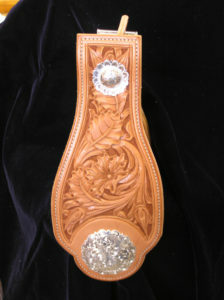 Sterling Silver sting conchos Flower carving is the Number 5 Mixed Flower, free hand drawn and carved. 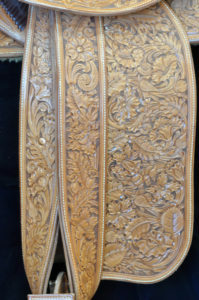 A classic copy of a Visalia 1930-40 vintage buckaroo saddle. If you are a horseperson who really appreciates the finest quality and one of a kind equipment, give us a try.